Emidio and Sons Banquet Center, 48 E. Bath Rd, Cuyahoga Falls. Price TBD but about $45 - $50 per person. If you aren't receiving emails please contact us at *****@outlook.Com with your contact information. Friday get together at Giant Eagle in Portage Crossings, 2nd floor. 6 to 9 pm. Saturd as y 8/13 dinner and dancing at Emidios Party Center on Bath Road, 6 to 11 pm with cash bar. Sunday brunch with advance reservation at American Legion on Front Street from 10 to noon. Cost is $45 per person and must be sent in be July 15th. You can contact Tom Lloyd at (330) 671-XXXX with questions or for more information. 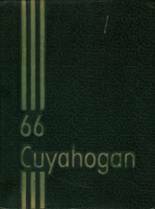 More 1966 alumni from Cuyahoga Falls HS have posted profiles on Classmates.com®. Click here to register for free at Classmates.com® and view other 1966 alumni. The Cuyahoga Falls High class of '66 alumni are listed below. These are former students from Cuyahoga Falls in Cuyahoga Falls, OH who graduated in 1966. Alumni listings below have either been searched for or they registered as members of this directory.